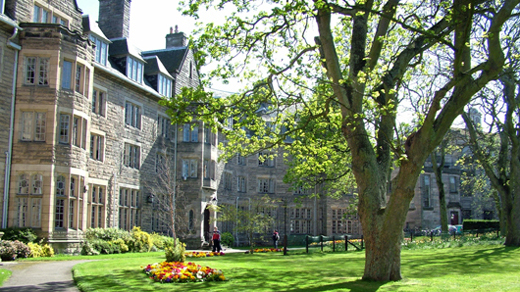 Four Emory students will spend a year studying in Scotland at the University of St. Andrews as recipients of the 2015-16 Robert T. Jones Jr. Scholarships. Kate Cyr, Peter Habib, Sara Stavile and Kadiata Sy were selected based on their academic achievements and leadership in programs and organizations on campus and in the Atlanta community. Commonly known as the Bobby Jones Scholarship, the award honors the late Robert T. Jones Jr., an internationally renowned golfer and Emory alumnus. Mr. Jones was not only an accomplished golfer, but also a scholar with diverse interests and a man known for his integrity and grace. The awards mark the close relationship between Emory University and St. Andrews University. The scholarship provides a year of study for four Emory students at the University of St. Andrews; four students from St. Andrews also spend a year studying at Emory in this exchange. Bobby Jones Scholars may seek a degree or take courses without seeking a degree. The Robert T. Jones Trust selects individuals who will be excellent representatives of Emory University at St. Andrews. In general, the qualities required to fulfill this ambassadorial scholarship include academic excellence, exemplary character, integrity and citizenship. The final selection committee includes Emory University faculty, Bobby Jones alumni and community supporters of the Bobby Jones Program. The scholarship has been offered since 1976, and there have been more than 250 recipients from Emory and St. Andrews universities. Kathryn (Kate) Cyr, a double major in international studies and Middle Eastern and South Asian studies, will pursue a degree in peace and conflict studies at St. Andrews. Kate is the founding co-president of the Emory International Relations Association, a Project Shine volunteer, and the founding secretary-general of the Model United Nations at Emory conference. She currently serves as vice president for Pi Sigma Alpha, the political science honor society. Peter Habib is a Middle Eastern and South Asian studies major and a development studies minor. At St. Andrews, he intends to pursue a degree in Middle East, Caucasus, and Central Asian security studies. A recipient of the QuestBridge Scholarship, Peter was selected for the Community Building and Social Change Fellowship and served this fall as an intern at the Carter Center. He is the president of the Emory Christian Fellowship and a member of the Emory Executive Roundtable. Sara Stavile, an English and creative writing major, will pursue a degree in modern and contemporary literature and culture at St. Andrews. A Dean’s Achievement Scholar, Sara is co-director of Alternative Breaks for Volunteer Emory, founder of the 1915 Scholars mentorship program for low-income students, and president of NERD, Emory’s science fiction and fantasy club. During her time at Emory, she participated in the Ethics and Student Leadership and Scholars and Service internship programs. Kadiata Sy is a double major in political science and Middle Eastern and South Asian studies. She will pursue a degree in Middle East, Caucasus and Central Asian security studies at St. Andrews. A Jack Kent Cooke Foundation Undergraduate Transfer Scholar, Kadiata is the founding president of the Emory Association of Middle Eastern Studies. She is also the co-founder and secretary of the Women’s Branch of the African Liberation Forces of Mauritania. Prior to coming to Emory, Kadiata was president of the student government association at Georgia Perimeter College. Two alternates for the 2015-16 Bobby Jones Scholars were also announced. The first alternate is Orli Berman and the second alternate is Brice Lawley.